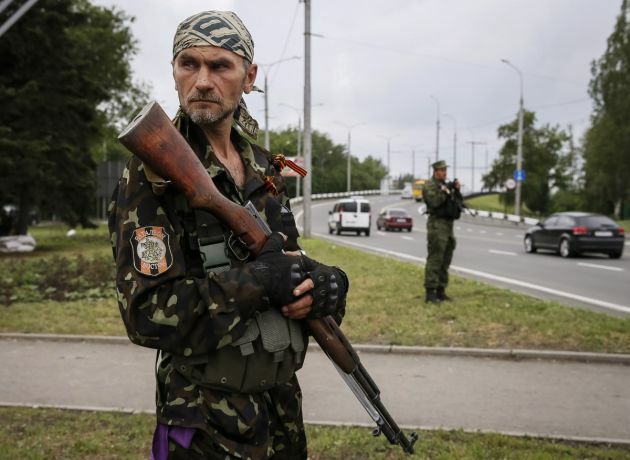 (Photo: REUTERS / Gleb Garanich)Pro-Russian rebels from the Vostok (East) Battalion stands guard at a checkpoint in Donetsk June 1, 2014. Ukrainian separatist leader Denis Pushilin said on Saturday six rebels had been killed while trying to collect the bodies of comrades who had died under Ukrainian army fire earlier this week close to Donetsk airport. Pope Francis has expressed concern about the conflict in Ukraine where the army and pro-Russian separatists have been clashing in fresh battles. "It is with a very sad heart that I pray for the victims of continuing tensions in some regions of Ukraine" said the Pope on Sunday at the Vatican. During his address the pontiff said he was concerned about the victims of violence in the Central African Republic. Francis said it was up "to all parties involved, that misunderstandings are overcome and that dialogue and reconciliation might be sought with patience" due to a volatile conflict in which European monitors have been detained by rebels in the east. Separately, Fr. Pawel Vitka, a Roman Catholic priest from Poland who was kidnapped May 27 by separatists in the eastern Ukraine city of Donetsk has been released. Vitka said he was accused of being a spy by separatists affiliated with the self-proclaimed Donetsk People's Republic, the Catholic News Agency reported and he recounted his ordeal and fears of being executed. The Polish priest's kidnapping highlighted the dangers that both religious leaders and lay people can face in lawlessness of eastern Ukraine. On May 10 the Ukrainian Orthodox Church of the Moscow Patriarchate said that one of its priests, Fr. Pavlo Zuchenko of Druzhkivka in the Donetsk region, had been killed. The New York Times carried a story Sunday entitled, "At Ukraine' perilous border, law is dispensed by men in masks" about another separatist area in eastern Ukraine, the Luhansk People's Republic, Independent State. The German websiteDeutsche Welle reported that for the Ukrainian government, the conflict is viewed an anti-terror campaign while for Russia it's civil war, "and for the people of eastern Ukraine, it's simply war." DW said observers are seeing the beginning of a wave of refugees heading west. On May 10 the Ukrainian Orthodox Church of the Moscow Patriarchate confirmed that one of its priests, Fr. Pavlo Zuchenko of Druzhkivka in the Donetsk region, had been killed. The Polish priest works in Kazakhstan but was visiting a fellow priest in Ukraine at the time. He as freed after 24 harrowing hours in captivity. "Tuesday morning I was praying with a rosary outside the DPR administration building," Fr. Vitka told CNA on the day of his release. "They asked to see my documents and I explained that I didn't have them on me at the moment." Local, pro-Russian separatist force seized control of the Donetsk regional state administration building in early April and proclaimed the establishment of the Donetsk People's Republic. The separatist have since April run many of their operations from that building in Donetsk. "I told them that I was a priest," Vitka said, "but they said that many people have claimed to be priests recently and that perhaps I was actually a spy. I told the main man that it's very easy to check in the Roman Catholic office of Ukraine, but I saw on his face that he wasn't going to check." After holding a referendum on May 11, disputed by many countries and in Ukraine, the separatists in Donetsk and in Luhansk declared independence. This has not been recognized by Western nations nor Kiev. The Polish priest described being left for two hours with two separatists, one of whom beat him on the knee. "I was scared in that moment when he hit me, as it was clear that he really knew how to hit." Vitka said the two men blindfolded him, bound his legs and hands, and put him in the trunk of a car before driving off. "I thought they were driving to the forest, where a grave was already waiting for me." They drove Fr. Vitka to the former Security Service of Ukraine building in Donetsk, also occupied by DPR separatists and he was held there for the rest of his captivity. "I was lying on a cement floor, just lying there and praying, lying and praying," Vitka explained. "Sometimes they came to check to see if I was alive." "In the morning, I heard that other people who were arrested got food, but they didn't feed me, so I thought that it was the end." Later one of his captors invited him to share breakfast. "While we were eating Ukrainian air forces flew over the building, so we moved downstairs. When the plane flew over, one of the men – the one who looked like he was ready to kill me the day before if someone had only given him a weapon – handed me his helmet and said, 'Father, take it, we need somebody to stay alive and pray for peace.'" The priest noted, "war is the devil's creation, but people remain people. People have a lot of bad things inside them, but also a lot of good."